after getting home from my two week road trip i unpacked my suit case then repacked for a weekend to the beach with my family. we always do random day trips to the shore but we decided to do a weekend. we went to ocean city for a few days. it was nice to just relax on the sand all weekend after being on the go the previous weeks, and walking down the board walk at night and getting delicious food. my favorite place to eat is MACKY'S, its on the bay side but you sit right in sand while the water washes up. they have the bomb mahi mahi cold dip and a hot crab dip served in a bread bowl. 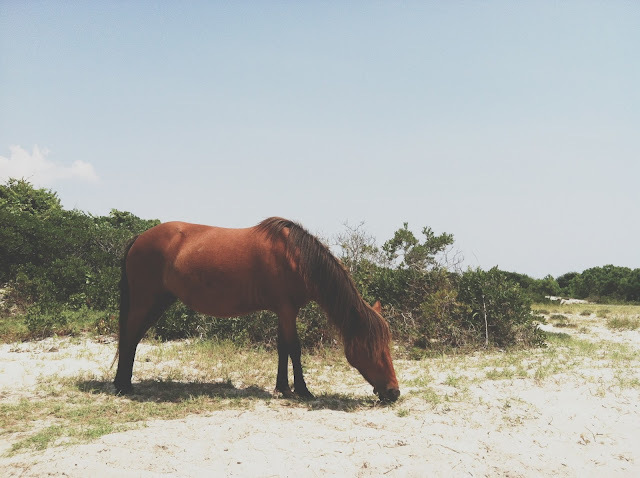 our last day we drove down to ASSATEAGUE ISLAND where wild horses run wild on the beach, its beautiful, you see them everywhere! now i am back home with a cold and heading back to work tomorrow, uhg!! once i'm feeling better i will be posting the Austin, TX part of our road trip.